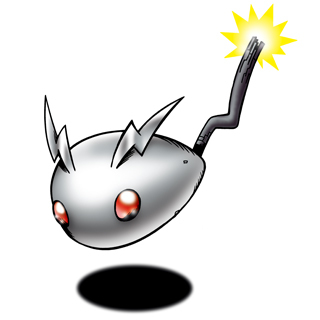 A super-tiny Machine Digimon which has red eyes that act as photosensors. The appearance of it moving around restlessly seems very cute, but because it is carrying nothing but a simple program that moves in reaction to bright lights, if its surroundings go dark it becomes completely unable to move. The reason why is not understood, but when it is in a good mood, it discharges electricity from the tip of its tail. Its Capture Move is releasing iron grains to cause temporary disorder in the opponent's AI (Jamming Powder). It flees while the opponent is confused by this technique. Baby level, Machine type Digimon. — Digimon Tamers: "Impmon Evolves! The Shudder of Beelzebumon the Dark Lord"
From Choroi (容易), meaning easy. Short for korokoro (「ころころ」), which means something small and round rolling. Choromon's shape seems to be based on an optical mouse, its eyes representing the photosensors used to detect movement. Jamming Powder  ジャミングパウダー Jyamingu Paudā Releases iron grains to cause temporary disorder in the opponent's AI. A Choromon appears in Digimon Tamers as a possessed driver of Behemoth, a sentient motorcycle who was terrorizing the Digital World. 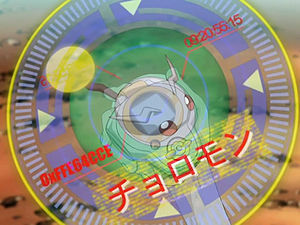 An injured Choromon is in the care of Jyureimon and the group of Nyokimon he protects. 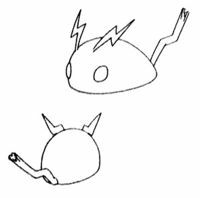 Choromon can evolve into either Caprimon, Mochimon, or Pagumon. Evolves to Hagurumon at level 11.